A lot of discussions are going on after the Paris climate agreement. There is no doubt that this agreement is not enough to secure a future for both people and nature. It is also absolutely sure that the target of limiting temperature increase to 1.5° C degrees—promoted by Small Island States—was the right choice to take. But sometimes having a deal is more important. And having a global deal is a historic step forward. But now the real work is ahead of us to ensure implementation, strong commitments and more ambition. And there’s also much more to do to elevate the Ocean’s potential as a climate solution. The ocean is essential to our lives and is inextricably linked to the health and stability of the global climate. Our ocean operates as a powerful climate regulator, absorbing 93 percent of the Earth’s heat since the 1970s and capturing almost 30 percent of human-caused carbon emissions. Our message in Paris was clear: In addition to a serious reduction in global greenhouse gas emissions and investments in clean energy, a crucial piece of our path forward must include protection and utilization of our natural capital. We know that natural solutions—ecosystems including barrier islands, coastal wetlands, oyster and coral reefs and mangroves—provide important buffers that reduce the effects of storms and sea-level rise. We know, for example, that coral reefs can mitigate 97% of wave energy. We also know that these habitats provide critical benefits for fisheries, water quality and ecotourism revenue. But these ecosystems also absorb and store large amounts of greenhouse gases. 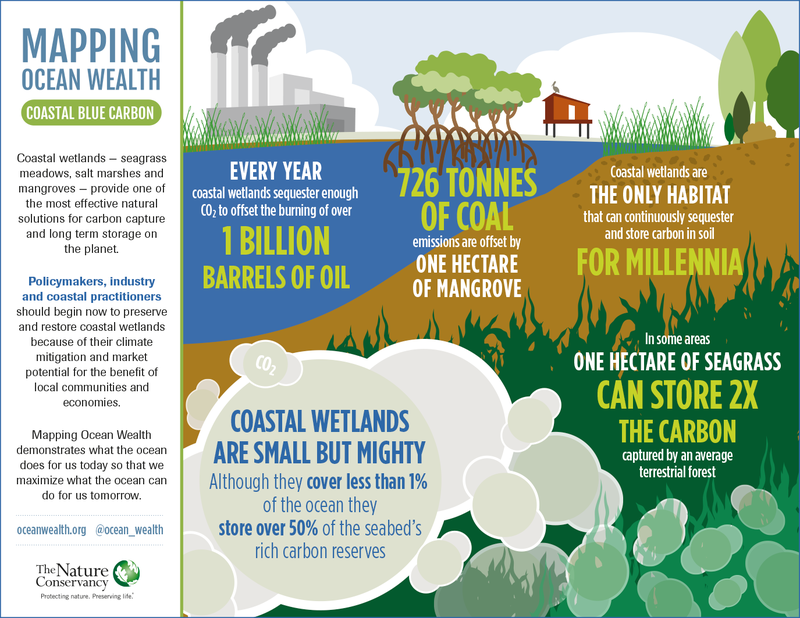 This is what we call “blue carbon.” For example, every year coastal wetlands sequester enough carbon to offset the burning of 1 billion barrels of oil, and can keep it stored for millennia. In Paris, representatives from the insurance and financial sectors voiced strong support for a coordinated and strategic approach to how we plan, finance and build our global infrastructure. The economic models show that natural solutions are the most cost-effective, especially when we account for the important co-benefits they provide. At The Nature Conservancy, our goal by 2020 is to shift 10 percent of global coastal infrastructure investment—approximately $10 billion—to natural infrastructure solutions. This is a win-win-win solution for people, nature and climate. The international ocean community really came together over the course of several days in Paris to call for the inclusion of the word “ocean” and its climate role in the final agreement. I am excited that the word “ocean” does appear, as does the importance of protecting ocean ecosystems. Now we have to put these plans in to action. To advocate for the ocean to have a central role in Marrakesh and beyond, and to continue the Paris dialogue that fundamentally shifts the way we discuss climate and nature. I am optimistic. More than a problem, the ocean is a global climate solution, and with continued effort and collaboration, we can save the ocean and our blue planet.